Zombie Towers: 5 Vacant or Foreclosed Skyscrapers Across the U.S. Tall buildings are economic bellwethers: Evidence suggests they tend to rise just before recessions, and they're the first to proverbially fall when the bubble bursts. Nowhere is that more obvious than mid-sized American cities. Do China&apos;s New Skyscrapers Really Signal an Economic Downturn? This week, light was shed on the half-vacant status of One World Trade (which joins the sorta-empty London Shard). But there was also a smattering of stories about smaller buildings, in smaller cities that are also sitting empty. Some are newly vacant, others have sat empty for years—but, either way, in these smaller cities the economic impact of a single building is much larger. These stories tend to slip under the radar—so we've rounded up five of the most visibly foreclosed, empty, or for-sale towers in smaller U.S. cities below. At the rate we're going, maybe we'll make this a weekly feature. 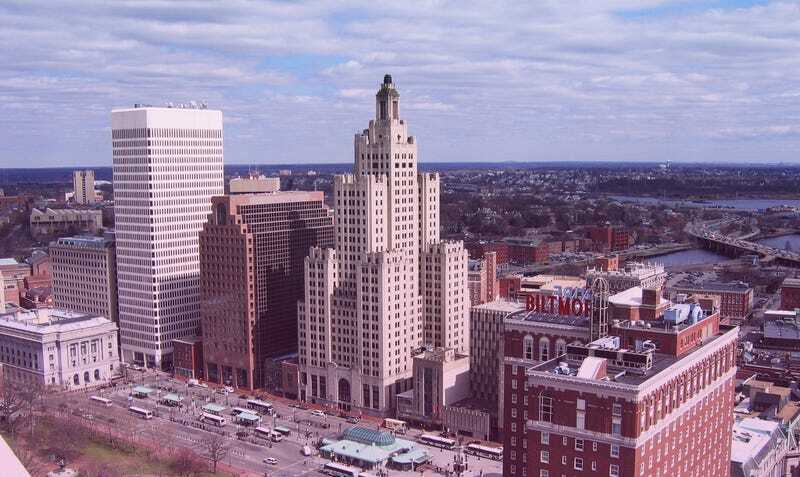 This 1927 Art Deco gem is Rhode Island's tallest building—it also served as the model for the Daily Planet tower in Superman. Today, it's vacant, save for its chief engineer, who has maintained it for 30 years. Speaking to The New York Times, he describes a peregrine falcon roosting on the facade as "the only tenant we have." One of Buffalo's biggest buildings, this 38-story tower has lost all of its major tenants within just a few months in a "mass exodus." Today, it's 3,000-odd inhabitants have been reduced down to a handful, and the art that once hung on the walls is being auctioned off for profit. "At the Tim Hortons walk-up counter in the plaza elevator entry, only one kind of soup is offered each day now, and the gates come down at 4 p.m," reports The Buffalo News. Vacant since 2011, this 16-story tower has changed hands again and again as it descended into decay. Today, it is home to a single caretaker and her husband (and their dog), though, rumor has it, a businessman from Toronto is looking to buy. Also, Elvis once stayed here. This 16-story, LEED-certified tower is only four years old—but it hasn't had a tenant for the entirety of its short life. It was built in 2009 based on speculation about rising rents in the Bay Area. This month, its developers defaulted on their $93 million construction loan—which will likely lead to the tower's eventual foreclosure and sale. One of St. Louis' first major towers since the 1960s, the Roberts Tower has been described as a "zombie tower" by local news site NextSTL. The 22-story building topped off just after the economic downturn, in 2009, but its interiors were left unfinished—now, a Chicago developer is claiming it will turn the building into condos.